wall coverings and framing exquisitely painted ceiling panels, smothering statues and sculptures, encasing lamps, trimming chandeliers and forming platters, bowls, and assortments of serving dishes speaks of how few ways the extremely rich could invest their money. This is a simpler palace on the estate, which Louis XIV built for himself and his mistress to live in and avoid the artificial etiquette necessary at the Chateau. 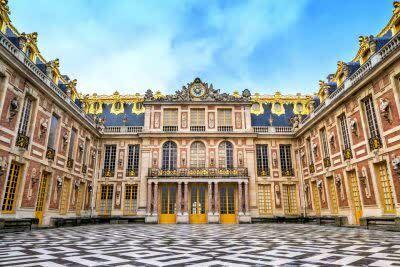 It soon became the private Royal Family quarters when Louis XIV moved his family into the Palace of Versailles Paris. The current decorations reflects the taste of Emperor Napoleon’s wife with bubble gum pink walls and gold-leaf head and foot boards enunciating the emblazoned motif with cherubs watching over the sleeping royal. Marie-Antoinette’s Estate consists of her palace aka the Petit Trianon, her farm, her own theater, her own hamlet, her mill and the Temple of Love where she and Louis would meet in private in a sheltered garden. There is a separate gated entry to her private estate and this is where she gave birth to her son. The gardens are much more intimate but the elegance of the rooms is in keeping with the glamour found in the other palaces. There is no way to get from the main palace to the Grand Trianon or the Petit Trianon without accessing the gardens. The fountains and statutes dotting the landscape accentuate the abundance of trees and potted flowers that are changed daily to present the freshest blooms and lavish perfumes as you pass by. There are three types of entry passes available. The least expensive is the half-day pass, the next is a full day pass; but the one for those who plan to spend more than a day at Versailles, is the Passport which can be purchased for 2, 4 or 6 days with the highest price being 59 euro. You can purchase the passes online, thus avoiding lines. The first Sunday of the Month from November until mid-March is free to the Public. Beyond touring the palaces and gardens, there is an excellent boutique on the site for some of the most exclusive souvenirs in Paris. Throughout the year, there are operas, ballets, and musical events in the several theaters on the grounds. The Passport ticket does include some of these events.